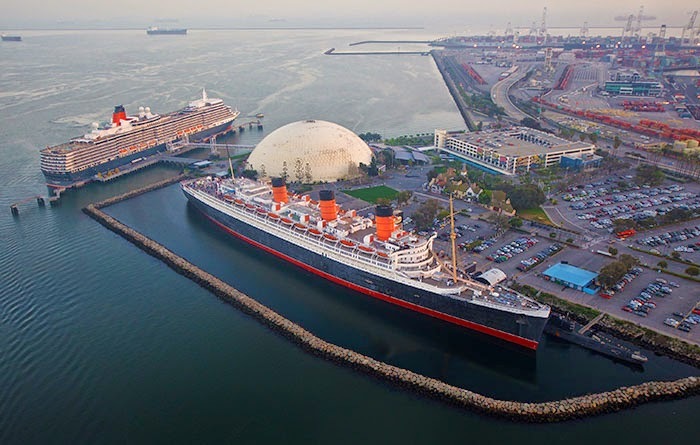 Cunard's Queen Elizabeth met one of her predecessors, Queen Mary, for the first time in Long Beach on Thursday, kicking off the start of Cunard's celebration in the US of their 175th year. Queen Elizabeth docked in Long Beach Thursday morning, marking Cunard's maiden call at the California port. Her berth was adjacent to Queen Mary, which is permanently moored there. As Queen Elizabeth was preparing to leave Thursday evening to continue her World Cruise, the two Cunard icons exchanged a whistle salute while overhead Cunard provided a dazzling fireworks display to celebrate the meeting. The complete story appeared in the February 6 edition of Cruise News Daily. Additional photos are still being added to this page. Viking Ocean Cruises' Viking Star will enter service in April. In December (2014) it underwent sea trials in Adriatic. It is currently in the final fitting out process at Fincantieri's Marghera yard, and all appears to be on schedule for its delivery in April. The video below shows some of the behind-the-scenes aspects of the recent sea trials. MIAMI – February 5, 2015 – Norwegian Cruise Line Holdings Ltd. (Nasdaq: NCLH) (“Norwegian Cruise Line Holdings”, “Norwegian” or “the Company”), today announced executive appointments reporting directly to President and Chief Executive Officer Frank J. Del Rio. Drew Madsen and Jason Montague will continue as President and Chief Operating Officers of Norwegian Cruise Line (Madsen) and Oceania Cruises / Regent Seven Seas Cruises (Montague). Wendy Beck will continue in her role as Executive Vice President and Chief Financial Officer with additional responsibilities for support services. MIAMI, Feb. 1, 2015 -- Carnival Corporation & plc (NYSE/LSE: CCL; NYSE: CUK), the world's largest travel and leisure company, tonight aired its first-ever Super Bowl TV commercial entitled "Come Back to the Sea" - a 60-second spot combining stunning cinematic images of the ocean and stirring words from President John F. Kennedy to create an emotional storyline about people's universal connection with the sea. "We are tied to the ocean... and when we go back to the sea, whether it is to sail or to watch it ... we are going back from whence we came," President Kennedy says in his distinctive voice heard by viewers as they see illuminating scenes of the ocean's natural beauty. In the commercial's full voice-over, representing a short clip from his speech kicking off the 1962 America's Cup, the President's remarks describe the emotional and innate connection that people have with the sea. The "Come Back to the Sea" spot was produced to create a personal connection with consumers, especially those who have never taken a cruise vacation, a key target audience for Carnival Corporation's 2015 marketing initiative designed to increase interest in and demand for cruising. The "Come Back to the Sea" ad is now available at www.ComeBackToTheSea.com and on YouTube's AdBlitz channel, along with the other spots from tonight's game, for consumer voting. "We worked with true passion to bring this creative concept to life with reverence and elegance to strike a chord with consumers, and we are proud to share it on the world's biggest stage," said Arnold Donald, president and CEO of Carnival Corporation. "Our existing guests already know that each time they go back to the sea on one of our ships, it is a unique experience that helps them connect in a special way with themselves, family, friends and the world. We wanted to convey that same feeling with people who have never cruised by showing the magnificence of the sea and its special place in our lives, and why cruising is a great way to relax, reconnect and recharge." Donald added: "Our overall goal is to successfully share that cruising is not what some people think it is, and to debunk untrue common myths that keep people from taking a cruise. We want to start among those who haven't cruised a conversation about why cruising is such a great vacation, at an exceptional value, and why cruising is an option to consider when planning a vacation. And, since we have nine distinctive brands that sail 100 ships to more than 700 ports around the world, we have a cruise that's right for just about everybody." To capture the essence of cruising and showcase the experience of going back to the sea, Hollywood director Wally Pfister and the BBDO-Atlanta creative team shot for nine days in Barcelona, Spain, including five days onboard the Regal Princess ship, the newest ship in the company's Princess Cruises line. Gathering breath-taking visuals of the open sea and unique moments in time from cruise vacations, the team produced a story that translates the unique and intangible experience of re-connecting with the sea into a 60-second commercial. Drawing on a wealth of storytelling expertise, Pfister and the team created a film-quality, documentary-style final spot with powerful visuals to help evoke an emotional response from viewers. "When creating a commercial of this kind, we knew we had a big task ahead of us because we aren't just asking consumers to purchase a product or widget, but instead, we are hoping to move them to feel a certain way about cruising," said Pfister, the Hollywood cinematographer known for his work on Inception and The Dark Knight trilogy and director of the Carnival Corporation ad. "With this particular spot, we wanted to transcend the so-called typical cruise commercial and create something that felt as visually powerful as the weight of the words being delivered by our former President. We worked with great care to bring these beautiful images together with his speech about the sea in a meaningful and respectful way, and we hope the quality and emotions of the piece really resonate with viewers." This final commercial was one of four fully produced ads created as part of the company's recently launched "World's Leading Cruise Lines Marketing Challenge" that gave consumers across North America the chance to provide Carnival Corporation with input on its new advertising creative. Hosted by Cedric the Entertainer, this interactive crowdsourcing contest let consumers "join the company's marketing team" and vote for their favorite creative concept with a chance to win a grand prize of a yearly cruise for life. More than 100,000 consumers voted on the ads and participated in the contest. The winner of the cruise a year for life prize will be announced next week. The "Come Back to the Sea" spot featured during the Super Bowl is part of Carnival Corporation's multi-brand marketing initiative that for the first time incorporates all nine of its global brands. Three other advertisements from the Carnival's marketing initiative, "Getaway," "Cruise Virgin" and "Message in a Bottle," are available on WorldsLeadingCruiseLines.com, on the Carnival Corporation YouTube page and on the World's Leading Cruise Lines YouTube page. As part of Carnival Corporation's marketing effort, consumers can use WorldsLeadingCruiseLines.com as a hub for new tools, functionality and content from the company's nine brands. This includes the popular new "CRUISE-A-NALITY" tool, which helps people decide what type of cruise vacation and brand experience is right for them based on a series of personality-focused questions. Together, these brands operate 100 ships totaling 212,000 lower berths with 10 new ships scheduled to be delivered between now and 2018. Carnival Corporation & plc also operates Holland America Princess Alaska Tours, the leading tour companies in Alaska and the Canadian Yukon. Traded on both the New York and London Stock Exchanges, Carnival Corporation & plc is the only group in the world to be included in both the S&P 500 and the FTSE 100 indices.